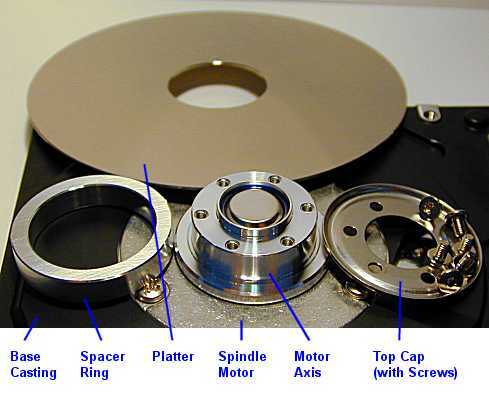 So this article is for all the users who have completetly no idea what is a hard disk drive and how it`s working. 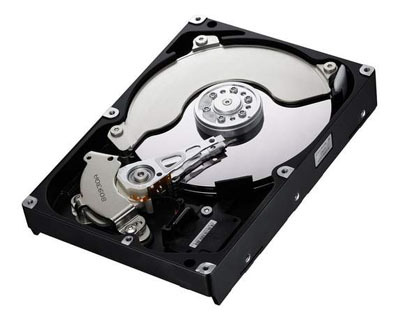 Basicly I am going to give you a simple explanation, which can be used as a base to improve your common knowledge or giv you the kick to keep reading further the articles about hard drives in this category. 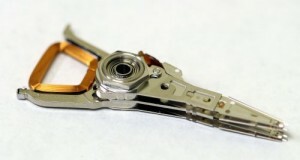 Common look of a hard drive. As usual I like to show a lot, so I will start with a picture. On the left you can see how a standrat hard drive looks – like a little metal brick, usualy having a label with a lot of info on top of it. 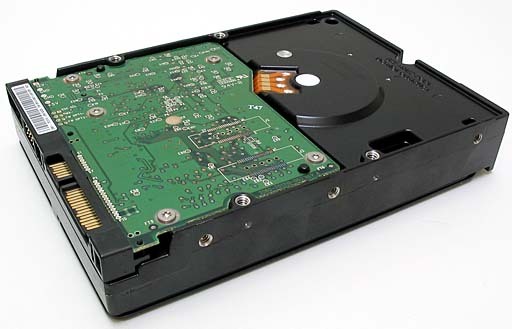 Probably most of you already have seen hard drives like this, maybe not. All you should know that these things are pretty stubern in an unplugged enviroment. I had the chance to play with a lot of them. And I mean really a lot. So I have been dropping them around, I have been jumping on them, I have used them to hold the doors – prety much everything. And what I have to say is that this things are pretty hard to destroy, unless you are intentionally trying to do it. 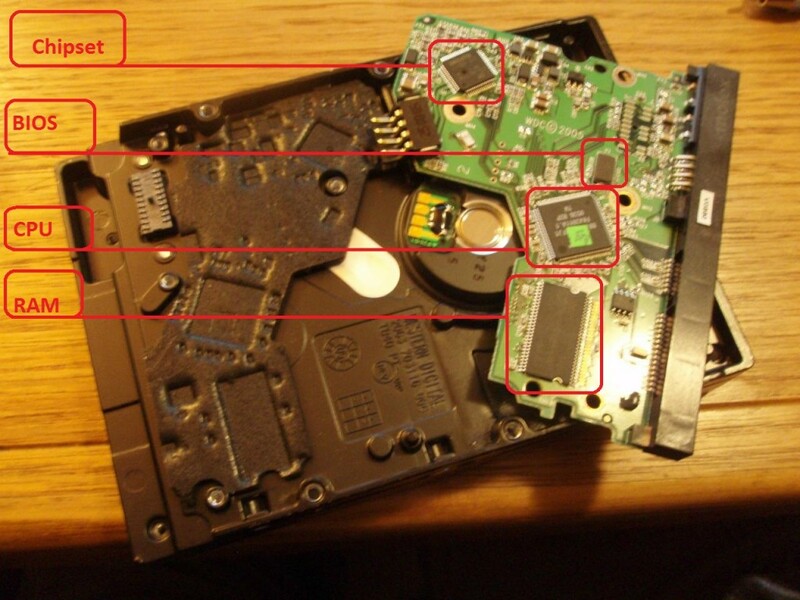 On the bottom side of the hard drive you can see there is a little board. Now that`s something you may not want to mess with, unless you feel pretty good in repairing such things. This is the hard drive controller. It is responsible for the power delivery and controlling the motors of the hard drive. And also it is in charge of comunicating with the computer you connect it to. As far as we are concerned this part is far too complicated for begginers so we can only point out a few interesting elements, so you get the general idea about it. The logic board of a hard dive is almost as a mini tiny computer itself. It includes a kind of BIOS(usually reffered to as “firmware”), it includes a kind of chipset which is responsible for all the communication with the ICs and it also includes RAM memory(reffered to as “buffer”). You can see an example of that on the picture, where i marked them for you. Things may vary form the picture. It is possible to have some more elements, or some of the elements could be united in a single chip, but the general idea is the same – the manufacturers will hardly escape this common scenario, where they have this elements on the logic board of a hard drive. So what`s next? Well, next we should take a look under the hood of the hard drive. Don`t remove the covers form a hard drive, unless you know what you`re doing(or you have decided to kill the hdd). So, under the cover you can see shiny disks aompanied by a tiny and very gentle reading heads. The metal disks are just as the same size as a CD or DVD, but they are fixed(pretty well) to the main hard drive motor, which rotates them. This is called spindle, and the metal disks are called platters. Each platter(it may be one or more) uses both sides to store data and is equipped with a magnetic head to read each of it`s sides. So if you have one platter, you will have two heads, if you have two platters you will have four heads and so on. Let`s get back to the heads. On the right, you can see a picture of a 4 head composition(which means it serves a 2 platter drive), where heads are stuck to each other two by two(because there are no platters between them). And you might be surprised to learn, but each of this heads is like a stereo reader`s head. Different in size, shape and precision, but it is generally the same as the one used for reading magnetic stripes or debit cards on an ATM. There are actually a number of things that complicate it a bit, but this is just because the manufacturers are trying to squeeze performance and long life out it to the maximum. So the logic board of the HDD is giving the commands, the step motor moves the head to a good position over the platters, which are spinning like crazy and them magnetic impulses are being written to the platters. This is all the magic about a working hard drive. 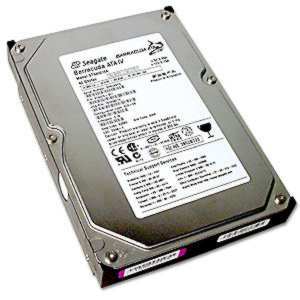 Keep on reading other articles, to get further understanding of some of the basic concepts for the hard drives.